Brief Synopsis – A widower with 3 daughters denies the possibility of ever falling in love again until he meets a woman while at a family reunion. 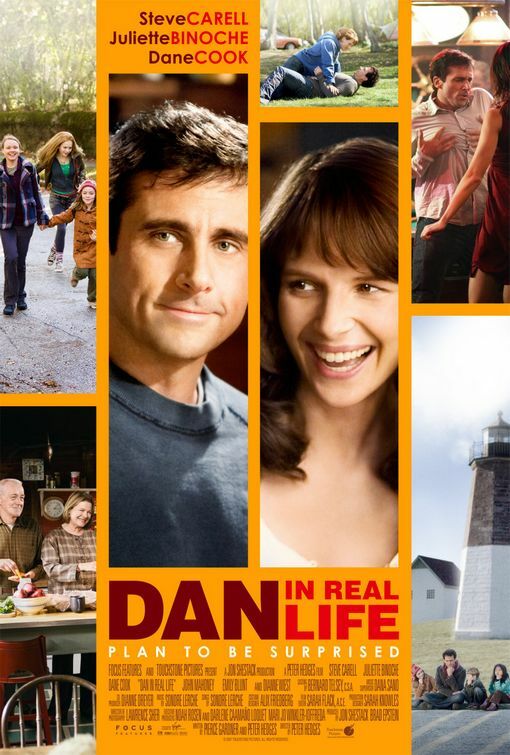 My Take on it – I first saw this movie when my bitter divorce was still fresh in my mind and I really felt a connection with the characters, especially the main character of Dan played by Steve Carell. I guess the idea of hope after tragedy (not that I can say in retrospect that the divorce was such a tragedy when looking back) 🙂 , was very appealing to me at the time and strange as it sounds, this movie impacted me so much that it helped me get back to myself and begin moving forward to improve my life. I can’t say that many of the characters are developed so well, but I found Dan and his family to seem somewhat real to me and I wish that I had such strong connections with my siblings and parents as they do. They seemed to have so much fun together at the family weekend retreat which makes me sad that I have never been able to experience such a family bonding as the characters here were able to do. This shows to me the power of family and love because it resonates so well throughout the movie. Having said all that, I must say that this viewing was less of a life changing experience to me as was my first one. I can’t say whether that was caused by where I am in life or by the fact that I knew what was going to happen. Either way, I still found this movie enjoyable with a very emotional message about family support in every situation one might find themselves in. This movie has an amazing cast. Besides Steve Carell, Dane Cook, Juliette Binoche, Dianne Wiest, John Mahoney, Amy Ryan and Jessica Hecht are all very strong here. Bottom Line – Great movie that shows the power of love and family. Excellent cast. Recommended! I’m a true believer that many comedic actors are at their best when they take on serious roles. Will Farrell, Robin Williams and Steve Carrell are some of the best among them. Just watched this one recently and I have to say, it was pleasant enough. Not perfect, but still made me happy and cheerful enough to where I didn’t mind that it all ended obviously. Good review Rob.